Hungary’s best artisans have designed this palace, which is amongst the finest creations of architecture in the world. The stay at this hotel, with its romantic ambience, renders an exhilarating experience. The hotel balcony, where you can sip your morning coffee, furnishes a splendid hill-view. This hotel is known for its peacock passage (historical Pava Udvar), where you can enjoy a drink right beneath the magnificent cupola. The breath-taking views of the finest expressions of Art Nouveau will bring out the personal intimacy. 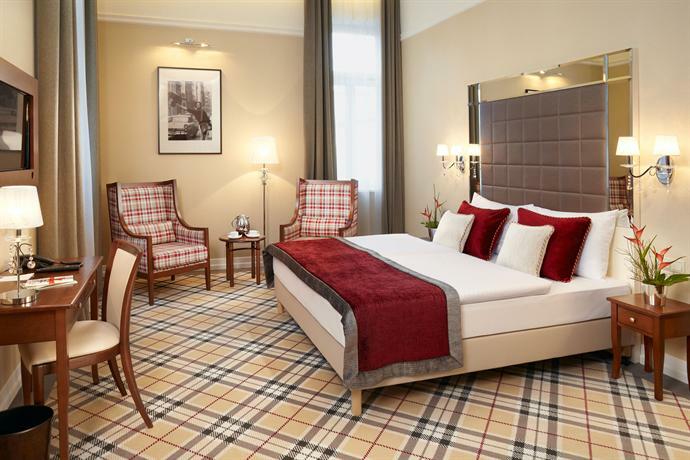 You can choose a Danube river view room, which personifies the beautiful experience. You can also enjoy a lovely swim with your partner in the indoor pool or relax in a Jacuzzi at the hotel. You can enjoy local cuisines at some fine dining places such as Kollazs restaurant and grab some drinks from The Bar and Lobby Lounge. For a luxurious, intimate stay, this hotel proves to be an ultimate choice. The hotel offers some great deals when booking certain room types and packages, such as ESPA treatments, massages and aromatherapy discounts. This hotel slips away gives you many specially designed intimate experiences. Under this offer, you get free buffet breakfast and free access to Royal Spa. If you book the room separately, you can still enjoy the facilities of a florist, sunrise breakfast etc. to make this stay exceptionally romantic. Don’t forget to enjoy the authentic dishes at the Rickshaw restaurant. And, for the various flavours, you should visit the Bock Bistro, known for its flavours. This hotel also has many other restaurants like Brasserie and Atrium for a casual dinner. On this romantic getaway, don’t forget to order a speciality coffee and a gorgeous cake from one of these restaurants. This five-star luxury hotel will create memories to cherish forever. With its tailor-made luxury ideas, this hotel always leaves its guests speechless. Where else will you get a chance to customise your pillow? Yes, it’s true. The hotel gives you an option between a butterfly-shaped pillow or a neck support. Also, you can choose the fragrance to which you will get up in the morning. These little details make your stay more romantic and intimate. The hotel is located in the centre of the town. So, you can slip away to buy a loving souvenir for your partner at any time. At the whirlpool bath, you can unwind all the tensions and get complete relaxation. Additionally, you can enjoy sumptuous meals and find fine at the hotel restaurants. Don’t forget to grab the exotic cocktails at one of the hotel bars during your stay. This hotel leaves no stones unturned to make your stay extraordinary. The historical grandeur provided by the 19th century New York Palace provides a splendid view of the intricate architecture. But the hotel believes in providing all the contemporary comfort that makes the guest’s stay romantic and luxurious. Hotel rooms are finished with lavish comforts including marble bathrooms and plush beddings. 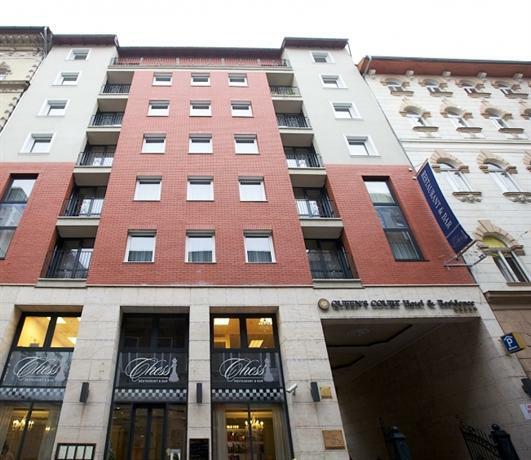 This hotel is located very near to the famous New York café which is a must visit place in Budapest. You can enjoy couple spa for an enhanced intimacy at the Boscolo spa. In-suite massage facilities are available to add to your leisure experience. Salon Fine Dining Restaurant at the hotel has been voted best in Budapest for its mouth-watering flavours. The hotel hosts a live music bar “Nyugat Bar” where you can sip your evening cocktails. You will be awed by the experiences at the Sofitel hotel. 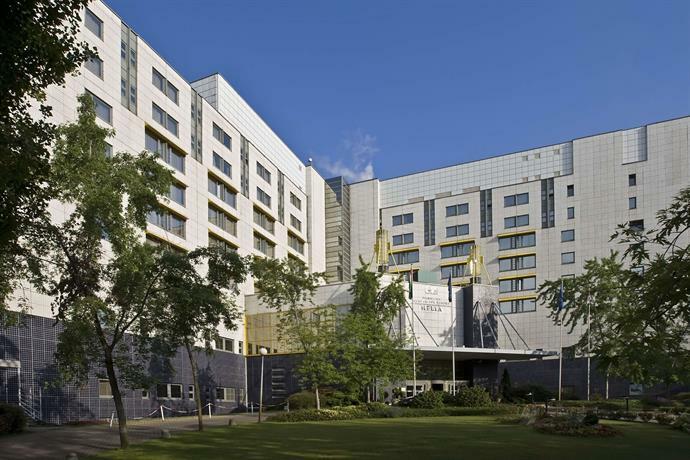 It lies in the heart of the city near the river Danube. Most of the attractions of Budapest city are nearby. So, you can enjoy a romantic stay during your visit to this lovely city, Budapest. This hotel has a replica of an aeroplane floating above you when you enter. The flamboyant style of the 19th century is well elaborated by the Swarovski crystal fountain which is a pleasure to watch. The hotel provides a romantic experience with its beautiful arenas. You can enjoy a lovely dinner at the Bibliotek Lounge with a trickle of Piano in the background. 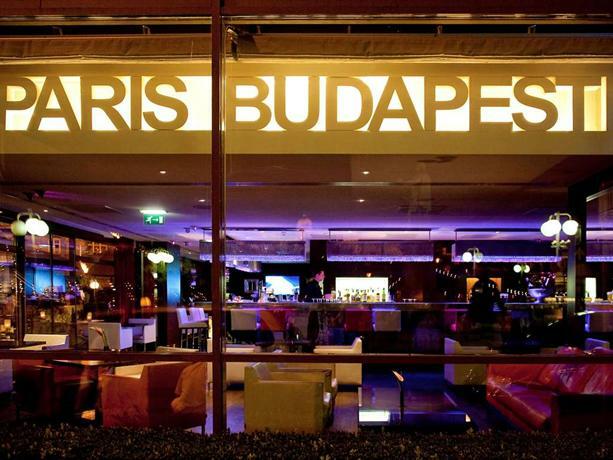 You can also choose to watch spectacular fashion shows at Paris Budapest restaurant at the hotel. Pamper yourself with Sothys beauty products at the spa with your partner. 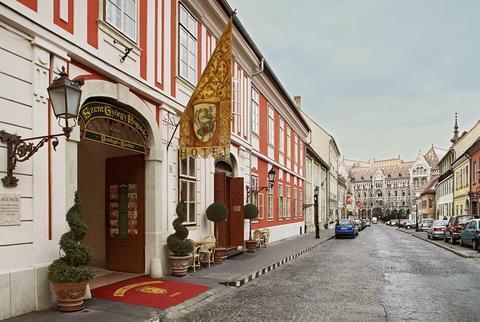 This oldest hotel in Budapest is worth staying at. The building is 700 years old and the hotel has been constructed 200 years back. You will definitely love the artistic building which has been recently renovated in 2007. A medieval wine cellar has been added where you can sip the finest wines with your partner. This first luxury apartment hotel in Budapest has 26 suites and a cosy courtyard. At the St. George restaurant and café, you will be reminded of the Buda at the end of 18th century. The atmosphere will make you reminisce the lovely times with your partner and have a romantic dinner. Impress your partner by using the flower and gift order facilities at the hotel. Private dining facilities are available for the honeymoon couples for your romantic times. A perfect amalgamation of history with the present is the concept of this luxury 4-star hotel. Renovated out of a palace, this hotel is bound to give you a royal experience. The real beauty of the palace with its beautiful interiors has been well preserved. You get a complimentary lavish buffet breakfast during your stay. Guests also get complimentary high-speed Wi-Fi internet and amenities like coffee, tea and mineral water in the lobby area until 5.00 pm. Freshly baked gluten-free local products can be enjoyed at the hotel bakery. Free unlimited access to sauna will let you enjoy a romantic couple spa for an intimate experience. Guests get an option of choosing between a superior room and a junior suite with well-equipped amenities and lavish interiors. 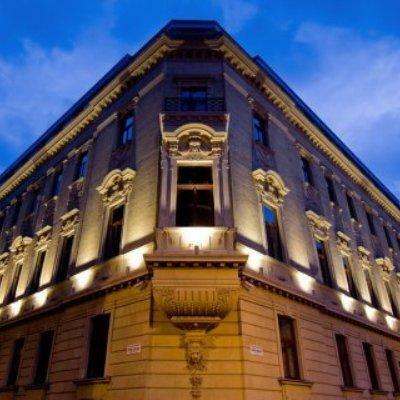 This 4-star Art Deco style fashion hotel is an excellent option for your next stay in Budapest. All 37 rooms at the hotel have been specially designed for romantic getaways with private balconies. 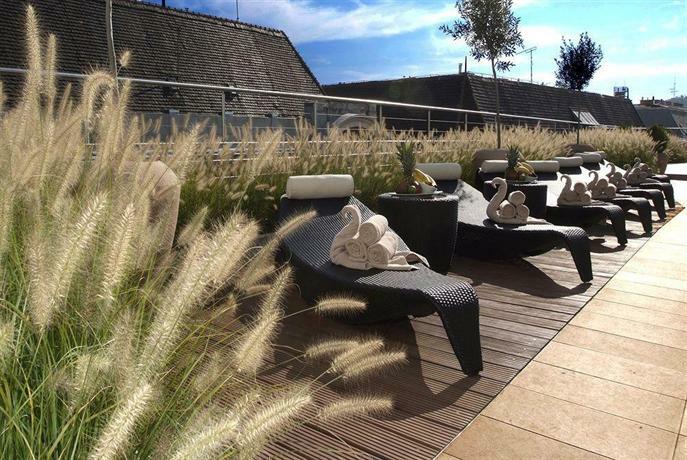 You can choose the rooms with a balcony view of the beautiful garden. Hungarian cuisine can be tried at the Fish and Chips Menza restaurant. On-site massages and a steam bath with your partner will add to an intimate experience. Free Wi-Fi facilities are provided to the hotel guests in all public places and also the rooms. If you love dancing, then enjoy a ballroom dance in the hotel’s ballroom. You can choose between the city view and the landscape view for your room at Mirage Fashion Hotel. Hotel staff is known for their cordial behaviour and try to make your stay as comfortable as they can. So, feel free to ask for any upgrades that you need. This four-star hotel is a perfect romantic place to stay for a couple. It is a grand hotel offering 272 rooms with standard, executive, deluxe and suite options. The hotel has been made with a thought of creating a place for its guests where they can relax and enjoy luxury in comfort. So, this hotel is well equipped with entertainment facilities and relaxation options. This hotel has an exceptional ARAZ restaurant with a possible seating for 120 people and serves best cuisines. State of the art spa facilities will add to your comfort and romance at this hotel. For evening tea and snacks you can visit the Gallery café with your partner and have a sip of specialty coffee served. “Enjoy the Hospitality” is the motto of the hotel which is self-explanatory of its facilities. Get ready for an adventurous yet romantic getaway at the Aquaworld Resort. This indoor water park is the biggest in Europe and a perfect holiday destination. 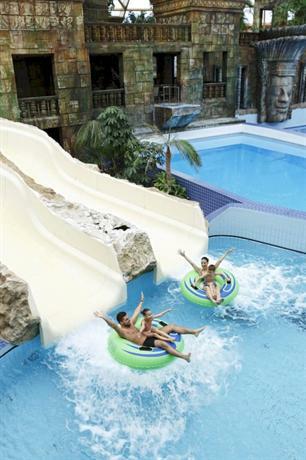 Located in the northern part of Budapest, this resort encompasses 11 giant water slides, waves and surf pools. Not only the adrenaline pushing activities, this waterpark also has saunas, thermals baths and Jacuzzis. After a long day at the Aquaworld, you can enjoy sheer luxury at the hotel which has 309 rooms with free wi-fi facilities. There is a three levelled Oriental spa in the hotel that offers a number of relaxation therapies for couples. 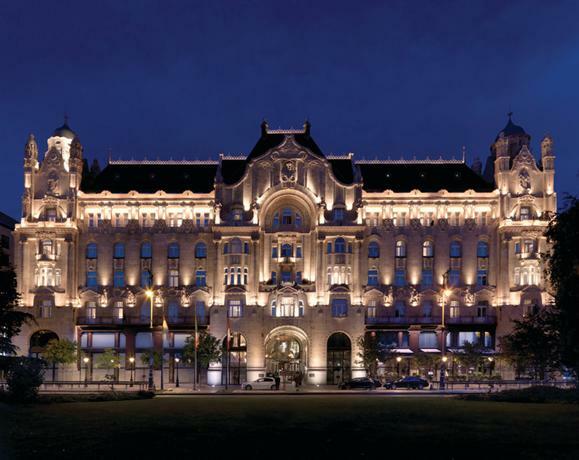 This hotel is overall an exhilarating getaway in Budapest where adventure meets luxury. So, all water lovers get attracted to this place. If you are looking for a new property, then this five-star resort can be your next stop. This luxury hotel has been designed for its guests to enjoy the homely environment. This all-suite hotel provides options for wellness and relaxation. A special offer for website bookers includes a delicious bottle of Hungarian wine. Queen’s court provides tranquillity at its wellness centre which includes spa, sauna, Jacuzzi and indoor heated pool. The swimming pool has an 8m high solarium wall from where you can enjoy the view of the courtyard while you sip your drink. You can enjoy French, Italian and Hungarian cuisines at the Chess restaurant. Good food, best wines and luxurious stay are the highlights of this all-suite hotel. The hotel is designed for a tranquil and relaxing stay for its guests. 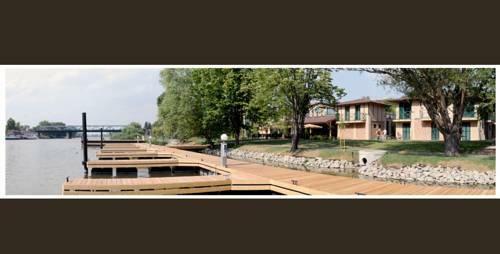 This jewel in the little Danube overlooking the wonderful water world landscape conservation area. This hotel has a unique atmosphere of former boathouses. The elegant design of the building attracts many people. Additionally, this hotel is located in the fishing paradise of this city. The hotel has 21 beautiful and cosy rooms. The unique feature is the 19 seater yacht harbour in the capital. Their yacht club gives rental facilities including a berth, electricity and water supply, pier cleaning and maintenance services at a nominal price. Special seafood delicacies are served at the Terrace Grill. A wide selection of wines is available at this a la carte restaurant which overlooks the beautiful scenery of Danube. 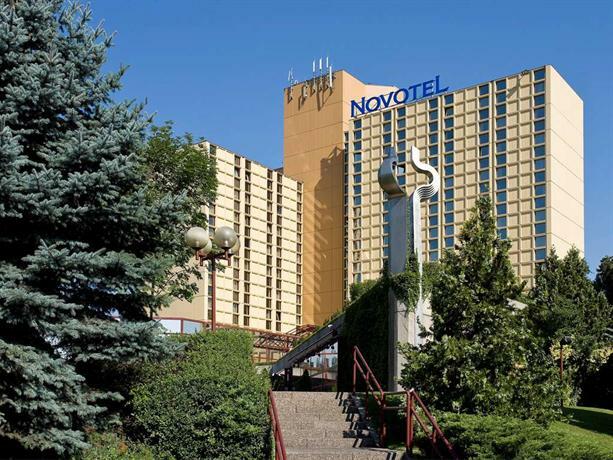 Book this hotel on your next visit to the lovely city Budapest for a luxurious Novotel experience. Novotel chains have made their mark in luxury and comfort provided to the guests. This hotel has a fresh design and perfect for those who want a slightly different experience than most other hotels. Rooms are spacious, comfortable and well-equipped. The ala carte services for breakfast, lunch, dinner and even snacks, gives you a completely relaxing experience with your partner. You can also choose to dine at the Café Lounge in the hotel for a variety of cuisines. At the Thalasso Spa, you get to choose between a number of Ayurveda treatments and couple spas to make this stay even more romantic. 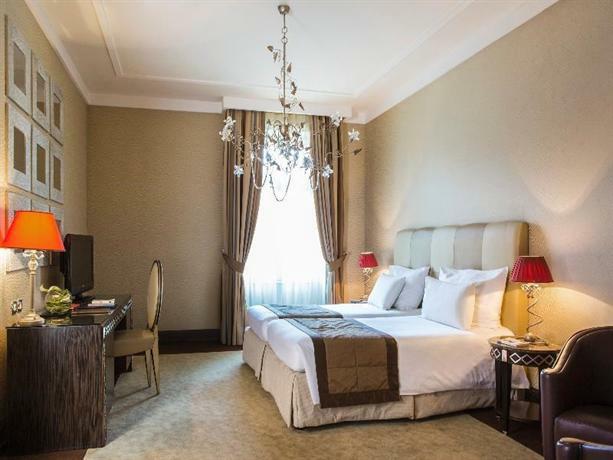 Stay at an executive room gives you an access to Nespresso machine, 20% waived off on bar and 30% on laundry services. 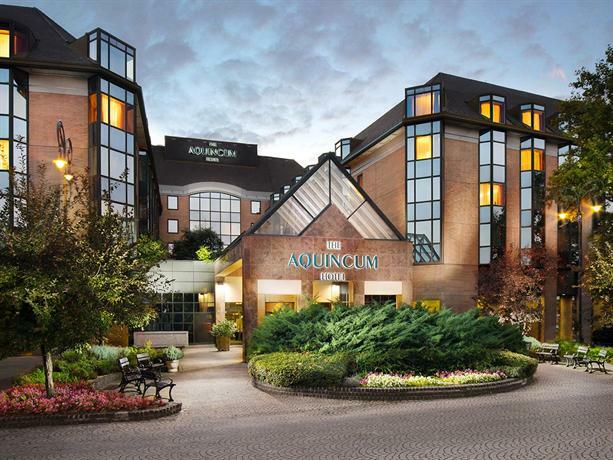 For guests in need of some pampering, this is a perfect stay. With its spa and wellness centre, this hotel provides a perfect romantic relaxing stay for the guests. 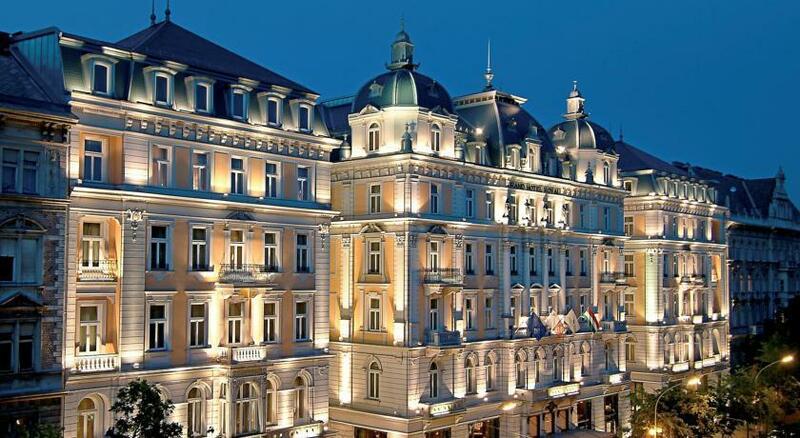 The hotel is located on the bank of Danube. Margaret island is nearby where you can enjoy recreational activities like cycling, walking and swimming. This hotel has an adventure pool for some adrenaline pumping activities, a swimming pool for a light swim, sauna and a fitness centre. You can enjoy thermal bath from the natural thermal water of Margaret island with your partner. At the Jupiter restaurant, you can enjoy the mouth-watering Hungarian cuisines and sip the best Hungarian wine. The guests even get an option of choosing a diabetic meal at the restaurant. 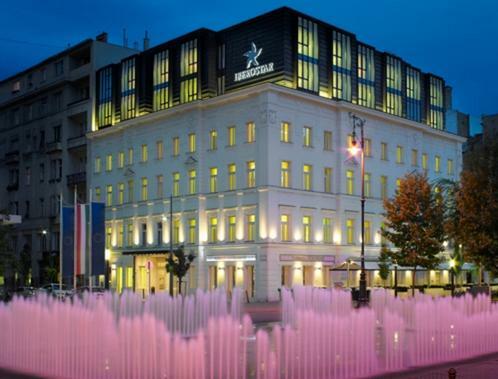 This hotel is located near the banks of Danube river and across the river from Margaret island. The most exquisite feature of this hotel is its spa. At this spa, thermal water is derived from the natural thermal water sources of Margaret island. There are 310 guest rooms and each has a panoramic view. Hotel’s ambience is very relaxing and perfect for romantic couple getaways. At Ambrosia restaurant, you get to select amongst best Hungarian and international cuisines. The menu is constantly updated and provides seasonal and fresh dishes. Guests can enjoy exclusive benefits when they book this hotel. These include “book now, pay at hotel” offers, complimentary spa use, free Wi-Fi, etc.